Doug Pederson has a new best-selling book, a supremely talented roster at his command and the sheen that still clings to any freshly minted Super Bowl champion head coach. His is a mountaintop experience in today’s NFL as the 2018 regular season looms. Pederson’s Eagles are the overwhelming preseason favorite to win the NFC East, and about the only truly pressing issue faced by Philadelphia is the question of who will start at quarterback in the nationally televised Sept. 6 season opener against the visiting Atlanta Falcons — last season’s third-place MVP finisher, the still-rehabilitating Carson Wentz, or the reigning Super Bowl MVP, Nick Foles? 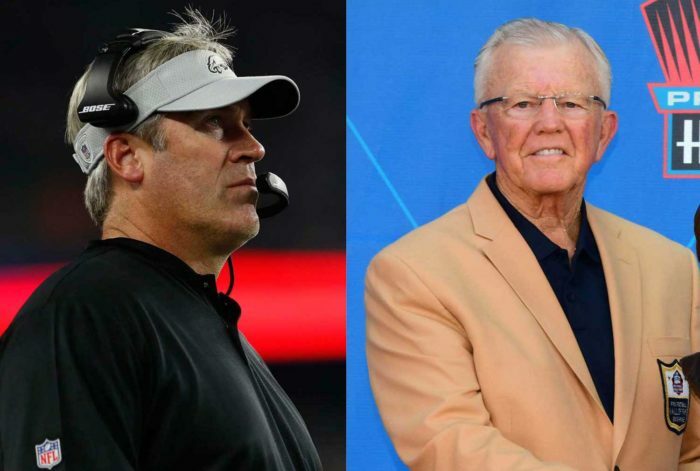 As he starts his third season on the job with the Eagles, having won a ring in just his second year as a head coach, there aren’t a ton of historical parallels to be found in comparison to Pederson’s early career coaching trajectory. But one in particular does jump out at you with gusto: Joe Gibbs. Thirty-five years before Pederson accomplished the feat, Gibbs won a Super Bowl in his second season as a head coach, with the Washington Redskins in 1982. Exactly like Pederson, he had an exclusively offensive-minded background, coached in the rugged NFC East and had been a successful offensive coordinator in the league for three years when he got his head coaching shot. After coordinating the pass-happy Air Coryell offense in San Diego in 1979-80, Gibbs went 8-8 in his first season in Washington, then led that storied franchise to its first Super Bowl title in 1982. After coordinating the potent Kansas City Chiefs offense in 2013-15, Pederson went 7-9 in his rookie year as head coach, then led Philadelphia to its memorable first Super Bowl crown. Joe Gibbs, meet Doug Pederson, and vice versa. Your similarities are showing. Eagles fans will no doubt sign up in a heartbeat for this particular comparison running its due course, given that Gibbs won three Super Bowl rings in the 10-year span of 1982-91, still the only Lombardi trophies Washington owns. Gibbs won a total of 140 games in his first 12-year stint with the Redskins (1981-92), losing just 65, a .683 winning percentage. How Pederson will follow up his early success in the head coaching game is one of the questions of the year in the NFL this season. With a young franchise quarterback in Wentz, a defense that has an embarrassment of riches along the defensive line, and a quality coaching staff headlined by former Lions head coach Jim Schwartz as defensive coordinator, the Eagles seem well positioned for another Super Bowl run, even in an NFC stacked with elite contenders. And if history offers any echoes, Washington and Gibbs are again a decent blueprint to follow. The 1983 Redskins team went 14-2, establishing the best regular-season record in franchise annals, then stormed through the Los Angeles Rams and San Francisco 49ers in the playoffs, before having their back-to-back Super Bowl ring dreams smashed in convincing fashion, 38-9, by the Los Angeles Raiders in Tampa. There have been others in the Super Bowl era who have won a ring in one of their first two years as an NFL head coach, but none that reached the lofty status of Gibbs, who was elected to the Pro Football Hall of Fame in 1996, on the strength of his four Super Bowl teams and eight seasons of 10 wins or more. Of that group, only Seifert and Flores won a second ring, with Flores beating Gibbs and his Redskins in the aforementioned Super Bowl XVIII matchup. Gibbs alone made a return trip to the Super Bowl the season after first making the game, giving Pederson something to shoot for. Tomlin and Flores were the only two coaches in that exclusive club to not make the playoffs the year following their early Super Bowl success, with the 7-9 Raiders missing the cut in 1981 and the 9-7 Steelers falling short in 2009. Pederson’s first goal in 2018 is obvious: ensuring his high-flying Eagles do not join that unwanted company, making the wrong kind of history.